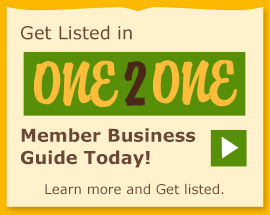 Genesee Co-op FCU is a non-profit, member-owned financial institution. Founded in 1981 by people dissatisfied with the corporate banking world, they decided to create a cooperative and socially responsible financial institution to serve the community. When you join, you become a member-owner of Genesee Co-op, which gives you the opportunity to become part of our decision-making process. All member-owners are allowed one vote in the annual election of our volunteer Board of Directors. Plan on coming to our annual meeting where we celebrate our yearly accomplishments, our wonderful members and our evolving story! 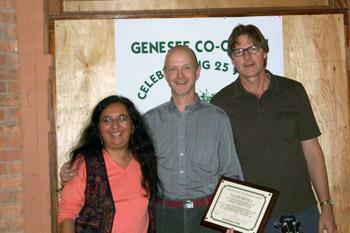 At 25th Annual Meeting, David Knoll is recognized for his contributions to Genesee Co-op FCU. He is pictured with Melissa Marquez, CEO and Michael Walker, Board President. Local activist Alison Clarke convinced David Knoll to research and lead the effort to start a community credit union. In December 1981 Genesee Co-op FCU receives our federal charter from the National Credit Union Administration (NCUA). On January 19th the new CU accepts our first deposits. At year-end we have 143 members with $84,000 in deposits and $29,000 in loans. The CU begins its efforts to expand by adding like-minded associational groups to the field of membership. Genesee Co-op becomes one of the smallest credit unions in the country to offer share draft checking to its members. At year end we have 292 members with $245,000 in deposits and $109,000 in loans. Genesee Co-op begins mortgage lending with our partner, CUC Mortgage Corp. At year end we have 555 members with $813,000 in deposits and $541,000 in loans. Genesee Co-op starts making student loans which quickly account for about 25% of the CU's loans. At year end we have 805 members with $1.7 million in deposits and $1.2 million in loans. At 10 years-old, our credit union is one of the smallest in the country to offer a debit card to our members. We have 1,028 members with $2.5 million in deposits and $1.5 million in loans. Genesee Co-op joins the National Federation of Community Development Credit Unions and receives our low-income designation from the NCUA, which recognizes the CU serves a majority of low-income members. The CU begins to recruit people to serve as VISTA volunteers working at the CU to help with financial education and programs to increase the financial assets of members through home and business ownership. At 15 years-old, we add a 24-hour Telephone Banking System. The CU begins its Homeownership Individual Development Accounts (IDA) Program. We have 1,534 members with $3.5 million in savings and $2.3 million in loans. Genesee Co-op FCU adds a second location on South Avenue, giving us a first-floor, neighborhood office, expanding into the Southwedge. The Money Management Mentor program is started. 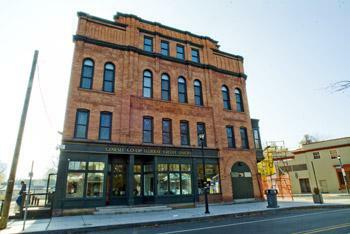 The US Department of the Treasury awards Genesee Co-op a $50,000 technical assistance grant. After 18 years, Genesee Co-op FCU closes its original Monroe Avenue location and consolidates operations at the South Avenue office. Active Website debuts and provides members with the ability to view account history over the internet. We have 1,827 members with $4.2 million in savings and $4.3 million in loans. The US Treasury Department’s CDFI Funds awards the credit union a $200,000 grant to further its community development work in Rochester. The CU launches our Microenterprise IDA and Lending Programs, which assists 25 very low-income women entrepreneurs with financial literacy training, business training and $1000 matching business grants . As we begin our 20 th year, we have 1,951 members with $4.7 million in savings and $4.1 million in loans. 20 participants in the Homeownership IDA program have purchased their first home and over 65 members have benefited from the counseling offered by Money Management Mentors. A deposit from the National Federation of CDCU’s and grants from Empire State Development Corp. help the CU offer loans to minority and women-owned entrepreneurs. After 20 years as the founding General Manager/CEO, David Knoll steps down to work part-time for the CU. Genesee Co-op FCU moves into the beautifully renovated Weider Hall building at 395 Gregory Street, completing a two-year process led by the Board of Directors to move the credit union to a larger facility. We begin featuring member artwork in the CU lobby. At year end, we have 2,442 members with $6.3 million in savings and $4.9 million in loans. The CU launches Online Banking, giving members access to their accounts for transaction services. Genesee Co-op FCU begins to have a student intern from Edison Tech and a summer intern thru the National Academy of Finance and the Rochester City School District. ESL FCU assists Genesee Co-op FCU with support for the summer intern. Genesee Co-op celebrates our 25TH ANNIVERSARY hosting a Summer Party at the Highland Bowl. In October, we unveil our new 24 hour ATM in our lobby and begin offering share certificates. ESL FCU provides a no-interest, long-term deposit at the CU to enable us to offer our share certificate program. At year end, we have 2,498 members with 6.9 million in savings and $5.5 million in loans. Genesee Co-op FCU offers our second-year of Free Income Tax Preparation as a partner site with the C.A.S.H. Coalition (Creating Assets, Savings and Hope). We provide tax preparation for 100 individuals and families who receive $130,000 in tax refunds and $60,000 in earned income tax credits with the help of five volunteers. 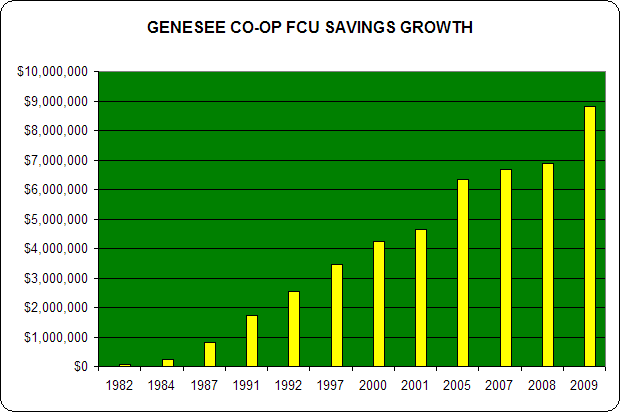 Genesee Co-op FCU witnesses a very strong year of growth for the CU, increasing to $8.8 million in savings and $7 million in loans with 2,615 members. The CU receives a grant to upgrade our website. Genesee Co-op made the tremendous switch from Mastercard to real-time VISA debit cards. The image on each card is the artwork of members Don and Cheryl Olney and the original can be seen in the lobby. In the mortgage department the co-op also began the First Home Club. The program rewards eligible savers with a 4-to-1 matching grant for every dollar they save which goes towards down payment and closing costs. The co-op also acquired a new ATM located at the branch that is free of charge when using Genesee co-op debit cards. 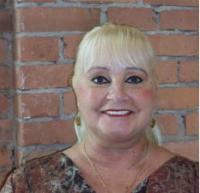 "The credit union has helped me straighten out my credit so I could own a home. They helped me every step of the way to homeownership right down to recommending and suggesting various avenues to save money and providing me with my first mortgage. They have always been there to make recommendations when I needed financial advice. I'm a member for life because they've made such a difference in my life."